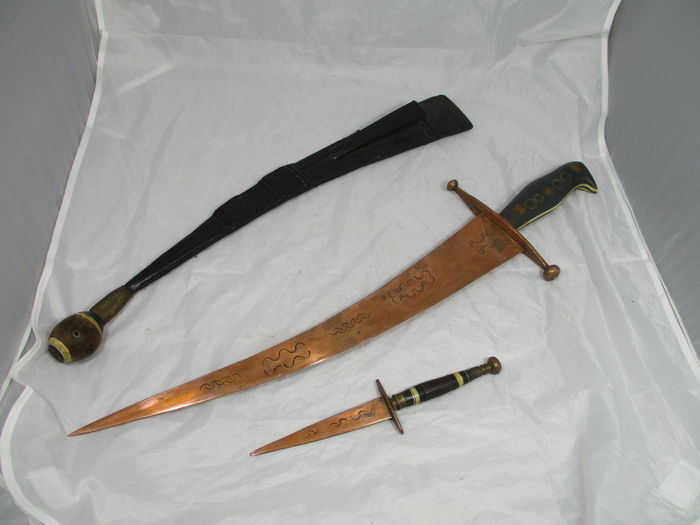 Could someone please tell me more about this African sword + dagger? Like the origin, how old it is, value etc? A picture of the items can be found in the attachment. Hope it's not too much of a disappointment, but I think it's probably pretty safe to say that these are strictly tourist-grade pieces. Are the blades copper or brass? If I had to date them (I am not an expert) I would probably point at somewhere between the late seventies to the nineties. No idea on the origin, they could be North African but similar blades can be found all over Africa and the Middle East in the tourist shops.